Cover Thoughts: Yet another cover that doesn't do the book justice! Not all how I pictured the h/h. Jackson Calabrese has a lot of nerve. He beat Lila Grant in the Culinary Academy competition using her recipes. Now, he’s opening a restaurant and wants her help? Fine, she'll fix his menu, but it's going to cost him. Heir to the Calabrese restaurant empire, Jackson can buy anything he wants, except creativity, so he buys Lila's instead. He can craft perfect paella, but to take New York by storm he needs her innovative spark. Skillets aren't the only things hot in the kitchen, and an uneasy truce ignites into passion. They’re great in bed, but Jackson doesn't trust her, and Lila is contemplating revenge. The restaurant opening approaches, the menu is completed, and the tables are set for one final act of betrayal. How can love bloom in the midst of such a hot mess? After going to the Lori Foster Reader/Author Get Together and attending a session that featured the author in it, I knew I had to read this book! I have to say no one was more surprised then me when I devoured this book and if I hadn't had started this book before going into work, I would have had it read in one sitting. This is my favorite contemporary romance of the year. I loved that it had the right mix of drama and sizzle. Lila and Jackson were just a refreshing hero/heroine. Both had a lot of trust issues with each other, yet it was justified and instead of being annoyed throughout the book like I normally am, I was cheering each of them on to finally see the light that they were meant for each other! Lila has all the qualities I love in a heroine-strong, independent and isn't afraid to tell Jackson to take a flying leap when he deserves. Jackson was just endearing because he was so tough, yet at the same time didn't believe in himself at all and thought they only way to have a successful menu was to hire Lila-even though he didn't trust because of something that happened in Culinary School. I loved that even though Lila ha a super crush on Jackson, she still doesn't trust him for the same reason he doesn't trust her and fights her feelings for him, goes to work for him to get revenge and then starts to realize that even though they come from very different worlds, they are a lot alike, and he needs help believing in himself and that maybe revenge isn't the way to go after all. 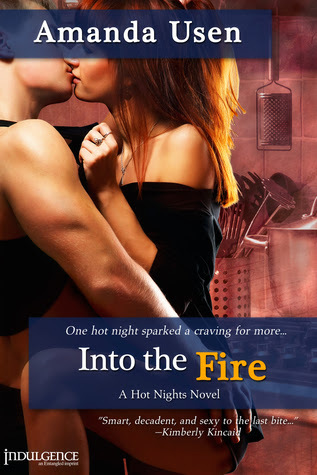 Into the Fire was just a sizzling hot, fun read that was over much too soon. I have to admit that I got a little teary eyed at the end of the book because the ending was just that sweet.